Charles Washington is a public speaker, pastor and author. He grew up in Gainesville, Florida and graduated from Eastside High School. As a child, he experienced the horrible impact of drugs, divorce and neglect. Throughout Pastor Washington's childhood, he remembers being constrained mentally by various socio-economic factors and visually seeing peers and family members in immoral situations. Although he faced many perils, Charles went on to graduate from high school, college and he earned his master's degree. 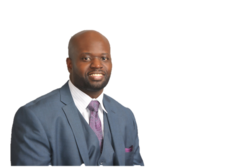 Pastor Washington has traveled throughout North Carolina speaking for the Department Insurance and providing information on consumer care. He has also gone on to become a successful entrepreneur, author and leader. As a new author, counselor and pastor, his mission is to motivate others to maximize their life, despite inevitable challenges. Charles resides in Raleigh, North Carolina with his wife, Julia, and their children Nathan and Taylor. Have you worked with Charles? Tell your friends! Charles hasn't submitted any articles.